New Breads on the Menu! 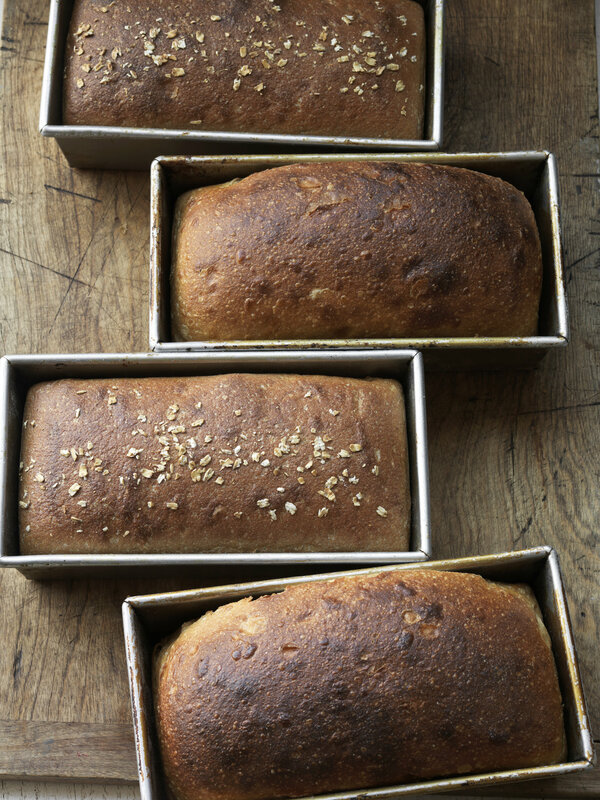 After much testing and deliberation, we recently approved two new breads that will be added to our menu. Both the Autumn Bread and the Cinnamon Raisin loaf were introduced to our customers this past weekend. 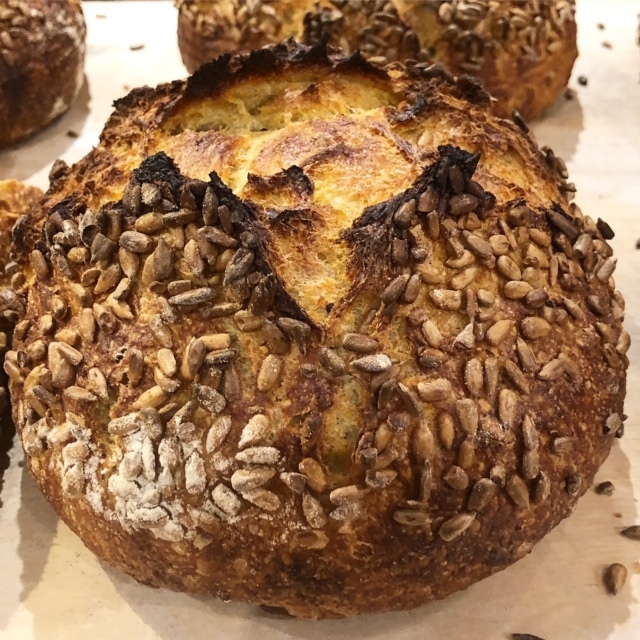 Our Autumn Bread is made with Durum flour and our bread flour and contains Kabocha/Butternut squash, Polenta, Sunflower Seeds and Pepper. The crust is covered with Sunflower seeds along with a dash of cumin and pepper. We just love this delicious and hearty loaf that pairs perfectly with a hot bowl of soup on a chilly fall day. It also makes great toast. 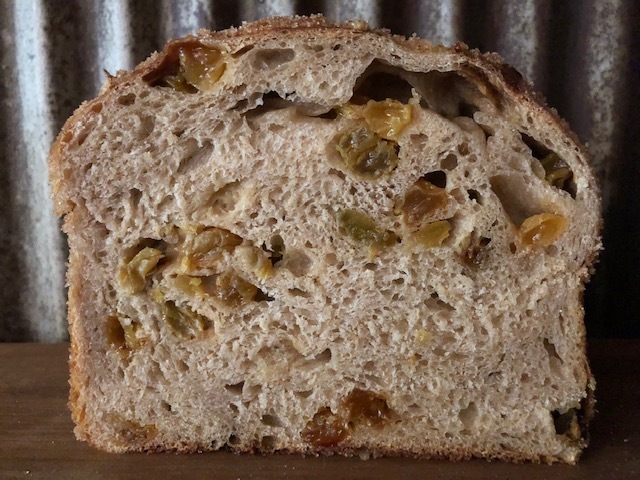 Our Cinnamon Raisin bread is made with our Blonde Country base and has brandy soaked golden raisins with a bit of butter and cinnamon sugar on the crust. It has a long fermentation and the sweetness from the raisins make this bread really delicious. Customers have been asking for a bread like this almost since we opened. We think this loaf was worth the wait! Our new bread schedule goes into effect this week. Please make a note of it! 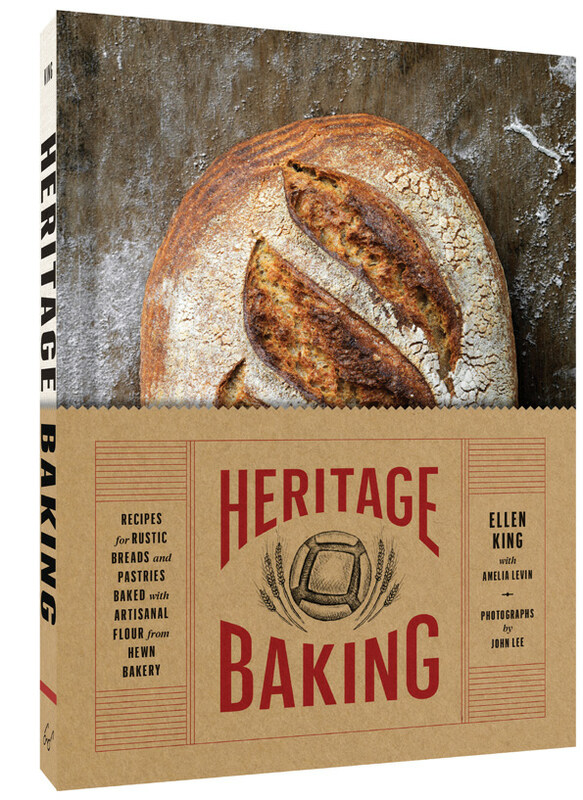 Heritage Baking hits the bookstore shelves on October 23, 2018. Mark your calendars for some of the events – near and far – that might be of interest. If you have family and friends in LA, San Francisco, New York, Boston, Seattle, and DC – let them know about Ellen’s appearances in their neck of the woods! In this month’s Newsletter, we wanted to highlight some of our local cookbook programs and appearances. If you have never been to Read It and Eat, Chicago’s cookbook bookstore, then you are missing out! Read It & Eat is dedicated to providing food lovers with exceptional culinary experiences through carefully selected books and events. Their book collection highlights selections on cooking and baking, organized by region, ingredient, technique, or specific diet; memoirs, travel, and food history; and beverages from coffee and tea to beer, wine, and cocktails. Ellen will be doing a demo, Q&A and book signing there October 24th at 6:30pm. Click here to register. Ellen is also excited to return to her hometown of Naperville, Illinois for a panel discussion at Anderson’s Bookstore with Harold Wilken of Janie’s Farm. This promises to be a fun and lively conversation….we hope you can join us! Chick here to learn more. Another program we want to highlight is Ellen’s presentation for the Family Action Network (FAN), scheduled for Monday, November 5th, 7pm at New Trier High School’s Northfield Campus. Ellen will speak at the Cornog Auditorium about the history of heritage grains and the importance of working with farmers to revitalize local grain economies. She will also speak about her personal and professional journey that culminated with opening Hewn and writing Heritage Baking. Samples from the cookbook will be served and books will be available for purchase at the event. We hope you can join us for this wonderful night of food and conversation. FAN is a 501(c)(3) organization that curates a free, high-quality human development speaker series each academic year. All programs are free and open to the public. Wednesday, October 24th: Read It and Eat official launch event, 6:30 pm. Demo and Q&A session. 2142 N. Halsted St, Chicago. To register, click here. Check our upcoming newsletters and our social media feeds for more information about additional events in the coming weeks. Coming Soon…our new and improved website! In just a few weeks, www.hewnbread.com will look very different. We are excited to partner with the talented staff at Evanston’s own Glanz Design. They are working hard to revamp the site and make it even more user friendly and informative for our customers. The new site will contain updated photos, information about our products and a new feature where you can purchase certain items online. (No food purchases online – we will still be “old school” and ask that you call ahead to reserve and come into the store!). Look for the new site to be up and running towards the end of October. As always, your feedback is appreciated! Our new website – still a work in progress, but coming soon! We are currently preparing for our busiest time of the year at the bakery….Thanksgiving Eve. Later this month, we will be emailing you all of the information you need to place your pre-orders. Breads, dinner rolls, desserts and and our ever popular take and bake morning buns will be some of the featured items on our Thanksgiving menu this year. This is also one of two times during the year that we make pies! This year’s Thanksgiving pies are FEW Bourbon Pecan and pumpkin. New pre-order items include pumpkin pound cake and Pithiviers. (click the link to learn more about this delicious item). Later this month, look for an email from us containing all of the information you need to place your pre-orders. It’s never to early to start your holiday shopping. Some new Hewn apparel has just arrived – and more is on the way! If you are looking for a cozy sweatshirt, then this unisex zip hoodie is perfect. We love how soft and roomy it is to allow for layering on crisp fall days. 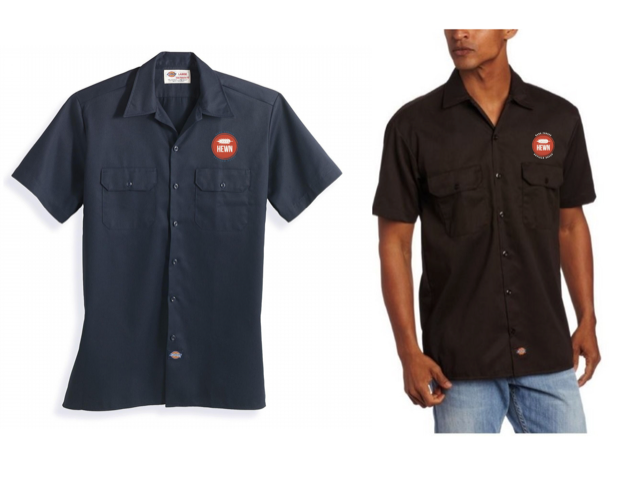 Also on the way are new Hewn Work Shirts. Our staff is really excited about this new addition to their Hewn wardrobe. Men’s and Women’s sizes are available in limited quantities. We are also working on winter hats and a new travel coffee mug with illustrations done by our very own Hannah Bess Ross! Stay tuned for more information in the coming weeks. That you can purchase our breads and other items at specialty grocery stores in Chicago? 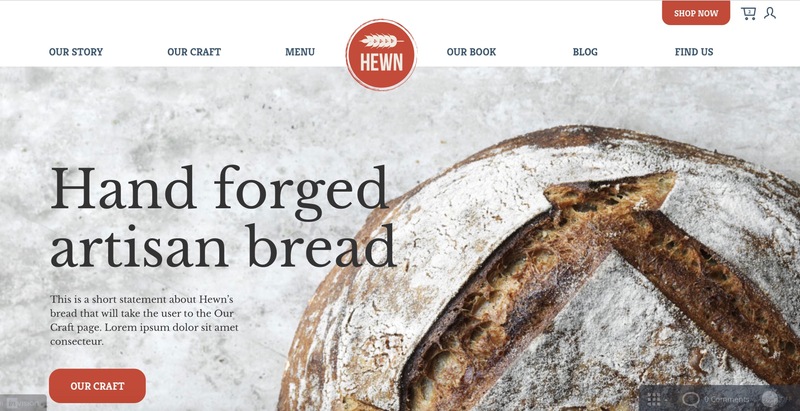 If you can’t make it to the bakery, look for Hewn products at The Dill Pickle and Plum Market. Our new staff members, Drew Oller (Front of House), Camelia Camara (Pastry/Baker), Lauren Biernacki (Pastry/Baker) and Julie Exposito (Admin). We are happy to have you on the Hewn team! To celebrate, we will be making delicious sugar cookies in the shape of pumpkins that will be sold in our ever popular cookie sleeves. Look for them at the store beginning next week. That’s all for now – hope to see you at the bakery soon!